A new style of treatment is gaining traction in the US, and is set to follow here in Australia. We chat to some of the clinics finding early success with a fear-free style of exam. By Amy Gray. Loving pet owner Liz Buckly once tweeted “sometimes I wonder if I spoil the cat, seeing him with his iPad, in his yurt”. It ties into the trope of indulgent pet owners who spend thousands on their animals, whether it’s elaborate toys or jokes about their complex health requirements. And yet, for all the jokes, somehow the word indulgent became synonymous with empathetic when it comes to pet ownership. Yet there is a vast deal of difference between the two, especially when it comes to veterinary care. One form of empathetic care is the ‘Fear Free method’. 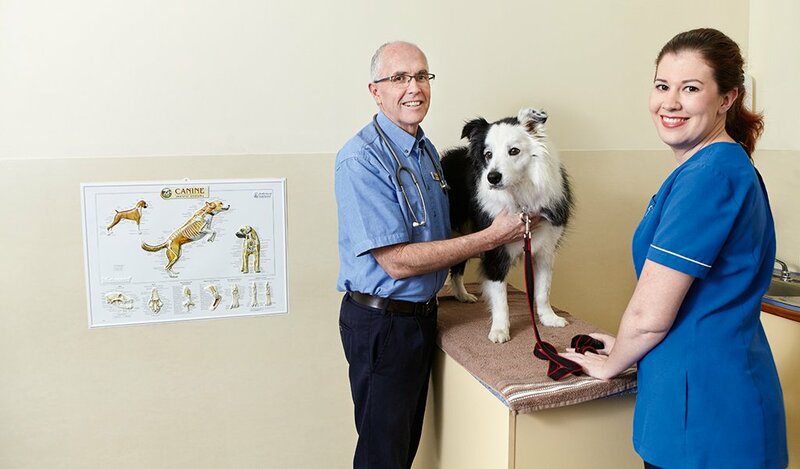 Popularised by US vets Dr Marty Becker and the late Dr Sophia Yin, this therapeutic model considers an animal’s behaviour as a central part of its care and that it begins before animals even leave their homes to visit the clinic. According to founder Dr Becker, 25 to 30 per cent of pets visiting the vet need sedation, putting their health at risk—particularly in the case of elderly pets. Leaving pets unsedated can lead to difficulty both diagnosing and treating them, as they are more likely to suppress their symptoms. The focus of the movement is on spending time adapting the animal’s environment and responding to its behaviour to minimise fear for many reasons—because it’s better for the animal’s emotional health, a calm pet is less likely to resist treatment, and the physical work of holding or restraining a pet is reduced. Dr Becker says that a fear-free clinic “will have a big treat budget”, referring to his own North Idaho clinic where detailed notes are kept on file about patient’s favourite treats—from specific cheeses, to hot dogs and beyond. The fear-free method is finding favour with many veterinary practices, including early adopters like the Camden Valley Animal Hospital in Narellan, NSW. Dr Andrew O’Shea had been implementing animal behaviorist techniques for years, but was compelled to fully implement the method after watching Dr Becker discuss his philosophy at a conference last year. According to practice manager Moire O’Shea, incorporating the fear-free philosophy has been a revelation for the Camden Valley Animal Hospital. “We’re seeing healthier and happier animals. The owners are able to administer medication better at home too,” she says. “Our main goal [is that] we always want to lift our standards of care and that we’re also lifting the client’s standards of care. We’re creating a really loyal client base that are willing to spend that little bit extra to make sure the pet gets the medical care it needs,” Moire says, adding that every consultation requires a full exam of the animals and discussion of their behaviour and personality. This philosophy is echoed by Allison Shand, head nurse for Pet Universe in South Australia. “The clients are more like family—you want the best for them,” she says, noting that their veterinary practice offers 30 minutes as a standard consult, unlike other practices who spend half the time. Pet Universe also ensure the standard of care offered to animals extends to caring for the pet owner’s fears, starting with fully explaining procedures in fact sheets and ending in giving complete estimates to allay financial concerns. Both practices agree that implementing the fear-free philosophy requires a radical rethink of how we run veterinary clinics. According to Moire, conventional practices “work in the business respect, but not for the animal’s care”. It seems that implementing the fear-free philosophy can give a point of difference to clients. Camden Valley has noted that, while following the philosophy may cost the practice and animal owners more for treatment, it’s a cost many are prepared to make. Moire says that “the clients are starting to treat their vets as they would their family doctor—we offer that extra care and the clients are noticing it” which results in loyal clients. Implementing the method of care at a veterinary practice can be costly, according to Moire, because “it impacts everything we do” when it comes to care and administration. It’s a similar situation at Pet Universe where Dr Alex Ong runs the fear-free program from their Northgate location. The model is used in every aspect of their work, from their veterinary clinic to their animal grooming and cattery businesses. The fear-free movement isn’t about indulging the whims of neurotic owners or their cats (or even their yurts). It’s about providing holistic care that understands an animal’s needs are more than the sum of their symptoms and that effective treatment will create a happier workplace for animals and humans alike. Many animals find direct eye contact aggressive and intimidating, so it makes sense to reduce eye contact to occasional glances at the beginning of a consultation to help put animals at ease. That’s how Allison Shand at Pet Universe describes how the vets treat animals—use soft hands. Soft patting and affection calm animals, while gentle touches during exams minimise stress. Whether it’s using warm towels, thundershirts for dogs or “clipnosis” for cats, using tools that bring out their juvenile comfort response will help. While this may not help you during the consult, it will help the pet feel more at ease around you and associate happy memories with the veterinary practice. Useful for dogs (DAP) and cats (Feliway) alike, pheremone sprays in the waiting area can calm animals before a consultation even begins. Let owners know to spray their car with relaxing pheremones before traveling with their pets to minimise stress. Putting an already anxious animal on a cold, slippery table will only make them more anxious. Many practices following the fear-free movement now use yoga mats for animal exams. It’s time to shift how we think about sedation from a last resort to the first choice. Using memory-inhibiting sedation helps pets relax, and not associate bad memories with the practice. Spend time in your consults to understand the pet’s personality and behaviour, which can often tell you just as much as a list of symptoms from the owner. Just like humans, music can definitely help soothe animals. Cats enjoy orchestral numbers mixed with nature sounds. While dogs may wish to be close to their owners, cats often feel more secure higher up. Pet Universe ofters seating for cats higher up on chairs and trolleys, so they’re in a more secure spot, which is calming for them. Camden Valley recommends keeping cats in their carriers covered in a Feliway-sprayed towel so they can feel more contained and less ‘at risk’. If your practice is large enough to feature multiple consulting rooms, it’s best to direct animals and their owners to wait in them, rather than a general waiting room. This means less exposure to other animals, which may be stressful for pets. The animals aren’t the only patients—the owners are too. Explain the philosophy to them and take them through the steps that will help de-stress their pets, from not overloading them with food before a consultation to using pheromone spray. Preferably something that allows you to track observations of animal patient behaviour over time. It makes it easier to track progress and develop long-term strategies. Camden Valley use Vetlink SQL.